Good morning, dear tea friends! A couple of weeks ago at work, I took part in a cupping of some China green teas – the Chun Mees and the Young Hysons. 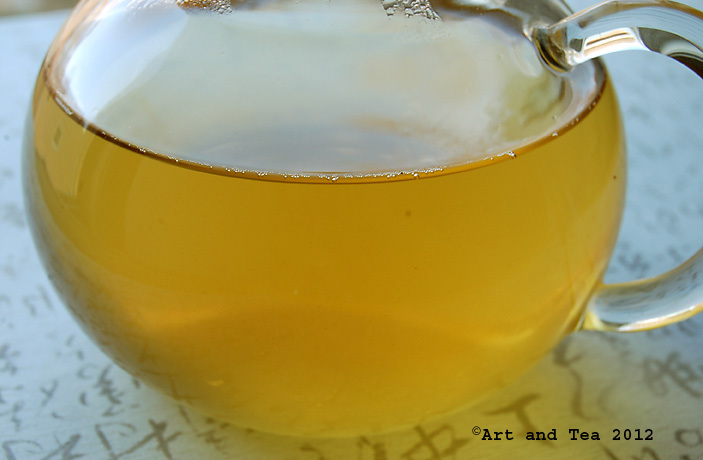 This morning I have brewed up a pot of my favorite tea of that grouping – Chun Mee Moon Palace. I do admit that part of its charm lies in its cool name but, for me, it really shined in its flavor. The name Chun Mee translates to “precious eyebrows”. 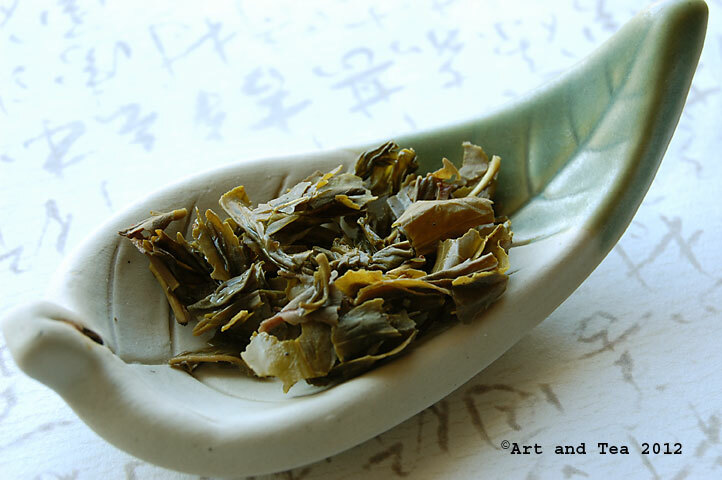 After withering and steaming, the leaves are rolled into thin curved shapes resembling a porcelain doll’s eyebrows. I wrote about another lot of Chun Mee here. The Chinese are very fond of naming their teas. I steeped the leaves for 3 minutes in 180 F water as I do with most green teas. After steeping, the leaves look more like bushy eyebrows, don’t you think? The deep yellow liquor gives off a fresh vegetal fragrance. The flavor is also vegetal, lightly so with pronounced fruity nuances, like pear and melon. It is the fruity nuances that make this tea so enjoyable for me. As my tea cooled, it got sweeter. 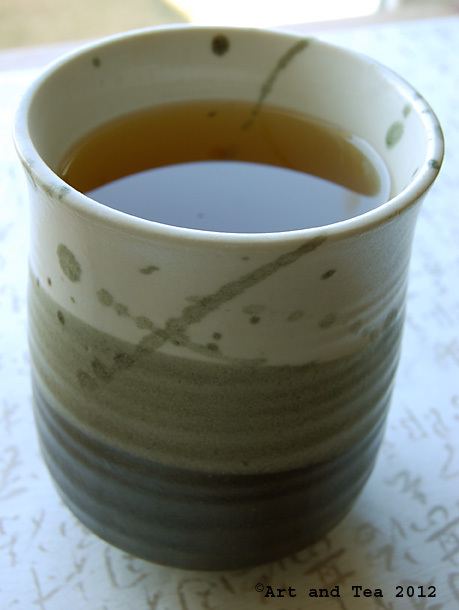 As I continued to sip this tea, an astringency began to flower, leading me to think that I probably oversteeped it. So with my next pot of tea, I’ll experiment by pulling back on the steeping time, probably starting with a 2 1/2 minute steep and then possibly working back to a 2 minute steep. As I’ve talked about before, it’s amazing how different a tea can taste when you adjust the steeping time a small amount of time. I like to be open to the positive qualities of a tea and believe that I can develop a relationship with it with some minor adjustments. 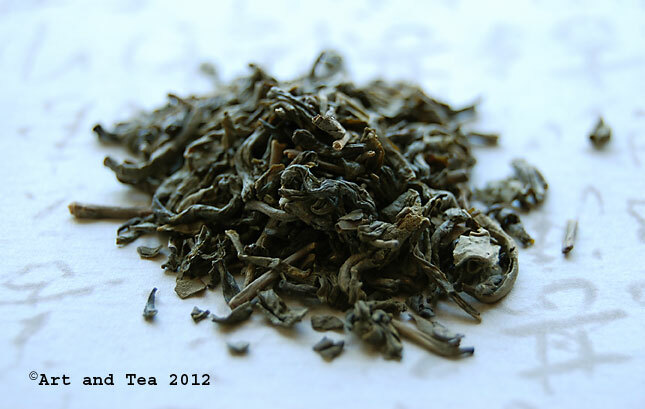 Too often I hear stories of folks thinking that something is wrong with a tea after just one steeping. I encourage everyone to experiment and see what works best for them. 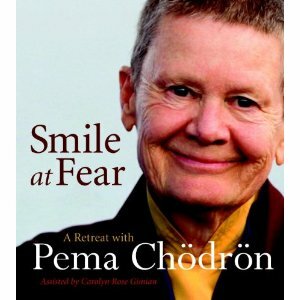 After that period of experimentation, if you still don’t like it, well, that’s just what it is – you just don’t like it. It doesn’t necessarily mean that there’s something wrong with the tea. Enjoy the journey! 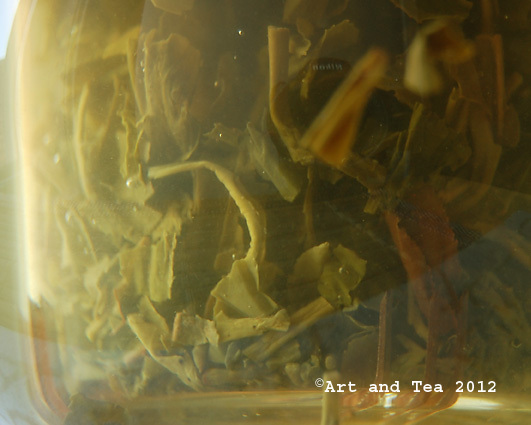 Next week I will be attending my art guild meeting so there won’t be any new tea post on Saturday. I’ll be back in 2 weeks to share another cup of tea with you. Until then, dear friends, happy sipping! This entry was posted in Green Tea, Photography, Tea and tagged Chinese Chun Mee green tea, Chun Mee tea, Precious Eyebrows tea.